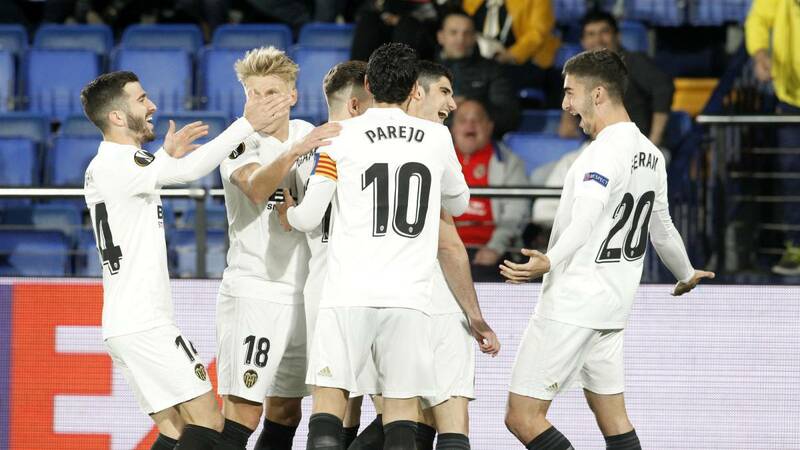 The goals of the Portuguese and Wass in the discount give advantage to Valencia in the first leg of quarters and return to punish with harshness a Submarine that enlarges its black week. Villarreal arrived at the 90th minute relieved because, after a black week with injuries from Celta, Barça and Betis, could bring alive the derby of Europe to Mestalla. Until Wass and Guedes, with a draw, gave the lace in the discount with two claws that confirm that there are few attacks as fit as the Valencia. Guedes had already made the first goal in the 6 'second instance, after Andrew and Parejo stop his second maximum penalty in a week. Cazorla had equalized in the 36 'to take another atropello of Garay to Iborra, not caring that four days ago ended up crying for failing in Seville from the eleven meters. No one will remember that anymore. Some will talk about two golazos made in Marcelino that are a sentence. Others, that it is almost impossible that this Submarine does not sink with such a rain of bombs. The match was beautiful in the first half. Valencia always seemed to have more packaging and alternatives until the twentieth minute. Especially when, shortly after starting, he had already thanked another Villarreal defensive error that he will collect in that museum of horrors that he has been making this season. After the 0-1, Gameiro and Rodrigo were at ease. The match looked bad for a Villarreal who decided to leave his trench of five behind to return to 4-4-2. That drawing that one day patented Marcelino yellow and that Calleja inherited, showing that he was one of his faithful observing him from the branch. La Ceramica looked like a morgue. Only Cazorla, preserved better than an anchovy from Santoña, was able to cheer her up. What way to pull the car. His signing, at zero cost, and his salary, for 500,000 euros plus a bonus of 20,000 per match played, has nothing to do with the one he received when he was trading up. The Asturian is a gift for this Villarreal that one day he sold it for 20 million euros to Málaga. She is saved or not, someone owes him a statue. With the 1-1, and he in charge, the best minutes of Villarreal arrived, also grown with Iborra on the edge of the area. Neto deranged them. A goalkeeper who remembers Ter Stegen: brace like an octopus and stretches like a cat . Pese to the result nobody changed plans. The ball was for the local team, more released on Thursdays than with the Sunday work suit. Valencia preferred to steal it to counterattack, although it played with fire. A Submarine only needed to finish. Chukwueze made us think again if he will not be the first cousin of Vinicius. The day that the definition is polished will go from being worth 40 million to entering the club of the three figures. Valencia picked up the glove and clung to the freshness of its changes just when fatigue condemned his opponent. Gayá gave Wass 1-2 and Cheryshev, an ex, did the same with Guedes in 1-3. Another that, speaking of prices, ya seems to be cheap.